Created by a real barber using natural, pronounceable ingredients that'll make your facial hair happy. Robert Watkins is a barber of the Old School—he gives haircuts, but doesn't take shortcuts. Frustrated with the low quality of hair and beard products available on the market, he created these handmade pomades. 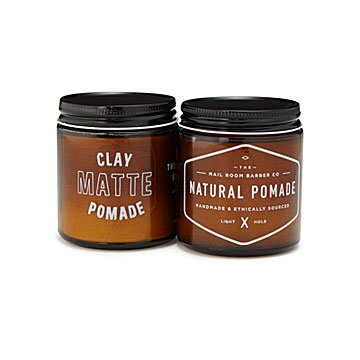 They're formulated with natural and responsibly sourced ingredients: The Matte Clay Pomade offers a soft, medium hold with hints of evergreen and jasmine essential oils, and the Natural Pomade gives a glossy, light hold that's scented with oakmoss and cypress. Both varieties are petroleum-free, and made from natural, pronounceable ingredients. And after a day's work of making you look great, both pomades wash out easily in the shower. Handmade in Florence, South Carolina. Robert Watkins is a barber of the Old School—he gives haircuts, but doesn’t take shortcuts. He was frustrated with the low quality of the hair and beard products that were available on the market. When he also learned that corrupt supply chains often utilize underpaid, child, and slave labor, he knew he needed to make a change. In order to reduce his impact in the growth of human trafficking, he began producing his own hair products, made from using natural, ethically sourced ingredients. Robert hopes that by spreading the word about human trafficking and providing an alternative product, he can help make a dent in the exploitation of women and children around the world.